The second painting in the challenge and I am no more organised than yesterday. 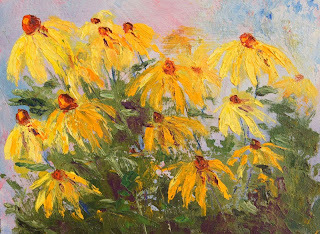 I have been wanting to paint my rudbeckias for the last few weeks so the perfect challenge for today. I used a prepared gessoed MDF panel that I had painted with a blue and pink underpainting. There's was quite a bit of texture on the panel so I decided to use thick paint applied with a palette knife to compliment the background.